BEAUTIFUL BUILDING LOT FOR SALE!!! 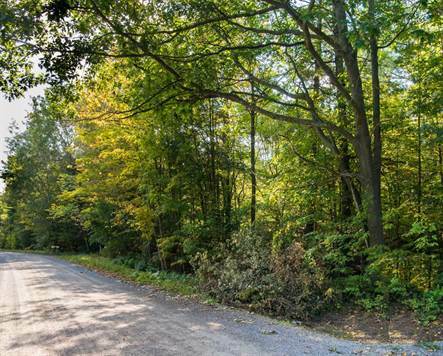 Build your Dream home on this PRIME BUILDING LOT in the municipality of Mississippi Mills just minutes from Almonte and Pakenham. The lot frontage is approximately 183 feet and depth is over approximately 665 feet, encompassing an area of approx. 2.6 acres. Hydro line is at the road. The lot is covered with a mixture of trees of varying ages and species and the surface is irregular with rock outcroppings. Both ends of Indian Road connect with CR29. Please do not let clients walk property with agent present. Lot corners are marked and there are some intermediate markers. Along the road, the subject lot front runs approximately 10 ft north of the second hydro pole north of the #155 blue marker up to about 10 feet south of the next hydro pole in the northerly direction. Sale is subject to HST. Travel CR29 From Almonte towards Pakenham. Turn LEFT onto Indian Hill Road and follow to signs.